Made of 93% quartz aggregates, Caesarstone countertops Dallas have a higher impact resistance and flexural strength than other countertop materials. This natural mineral based-material is also blended with pigments and polymer resins to make it completely nonporous and nonabsorbent. This composition combined with a precise, high-quality manufacturing process results in a surface material that offers many advantages that no material have yet to compete with. 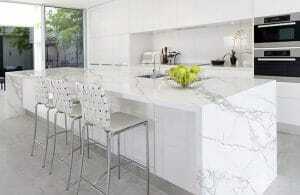 Why Use Caesarstone Countertops in Dallas? The biggest benefit of choosing quartz countertops is durability; CaesarStone for countertops in Dallas are resistant to heat, chemicals, mold, mildew and scratching. In a comparison between this type of quartz and other material, homeowners will find that manufactured quartz is far less porous. Meaning they do not stain easily, never needs to be sealed, and will not be damaged by cleaning products. CaesarStone countertops also perform better in terms of impact and pressure tests, proving they are less prone to cracking and breaking. In case you did not know, many different colors and styles are achievable with Dallas’ CaesarStone countertops. This allows homeowners to customize their countertops to match any décor style, from contemporary to traditional. With this countertop material, any design you want to implement is easily achieved. This is an advantage especially if you are looking for a huge remodeling project. Because they are manufactured and therefore less prone to defects than other countertop material options, CaesarStone countertops in Dallas come with a lifetime warranty on both the product and installation. Before you remodel your countertops, it is a good idea to explore all of the options and compare the pros and cons of each one. While granite is still a trendy and prized material for kitchen countertops, homeowners are discovering that CaesarStone has many advantages to offer. What are you waiting for? Give your home the countertop material it deserves. Call us at Hard Rock Imports to learn more about Caesarstone Countertops in Dallas! We will even give you a free design estimate! PreviousPrevious post:Seriously, Where Should I Buy Granite Countertops in Dallas?NextNext post:Are Quartz Kitchen Countertops Really For You?